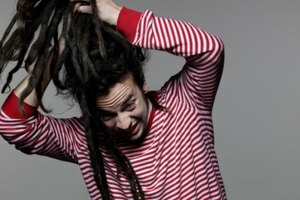 Dreadlocks, a hair style formed of strands of hair intricately woven together, have been worn since time immemorial. 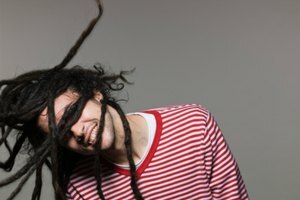 While original dreadlocks were of the uncultivated, free form variety, people eventually learned to cultivate and style them into looks that are very similar to loose hair styles. 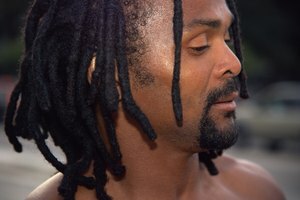 Dreadlocks can be started in curly hair using many methods including free form, single and double strand twists or individual braids. Installing starter twists or braids takes a few hours, but dreadlocking is a gradual process that takes anywhere between 6 to 12 months to complete. Shampoo hair and condition with a light cream rinse. Hair should be clean and conditioned but not too soft to hold a braid. Braid hair in big plaits and allow it to air dry, or alternatively use a blow dryer on a cool setting if you want to get started right away. Undo braids once dry. Divide hair with a comb in four large sections and secure them with clips. Part the hair into small to medium sized sections and braid or twist hair beginning from the back of the head. Continue this process until all the hair is braided or twisted. Make larger braids or twists in the back, and smaller ones on the top. Braid or twist in larger sections at the hairline to minimize tension in this area. After the hair is braided or twisted your locks are installed and ready to grow. Set locks or use perm rods or braid them to create crimp styles, or just wear them as is. Cover hair with a silk scarf before bed. Wash hair as often as needed or desired using a mild detergent based shampoo. Apply a light natural oil for moisture. Twist down new growth with a light holding gel. The locking process should be complete in 6 to 12 months. For soft textured hair apply a little holding gel on each section of hair before you braid or twist it and during maintenance sessions. 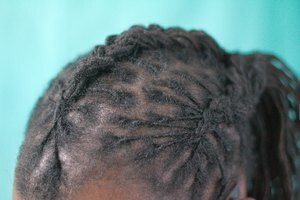 Because braids and twists will expand when wet, make them slightly smaller than the size you want your dreadlocks to be. Perfect parting is not important throughout, but if desired arrange your braiding pattern to allow for a defined center and side parts. Don't use too much tension when braiding, styling locks or tightening new growth. Excess tension on the hair will thin your hair out and may result in temporary or permanent hair loss. Avoid creamy shampoos, thick conditioners and products with a lot of wax or mineral oil because over time they will cause unsightly buildup in your locks that is hard to wash out. Based in Reston, Va., Lydia King has been a writer and editor since 1996, working with diverse subject matter including law, government contracting, philosophy and career guidance. She completed a Bachelor of Arts in history at National University, where she is pursuing a Master of Arts in English and comparative literature.